Fun and educational Kwanzaa art projects for preschoolers through second grade. During our Kwanzaa celebration, we make mkeke (mats). Fold a rectangular piece of black construction paper in half and cut 1 to 2-inch slits in the paper. Cut 1 to 2-inch strips of red and green paper. Have children weave the red and green strips in and out of the black mat and attach at either end. Now you have your own mkeke mats! To reinforce the colors of Kwanzaa, we make a Kwanzaa flag. The children cut red, green, and black paper. Then they glue the paper onto black paper. When they are finished, they have created their own Kwanzaa flag. Not only does it reinforce the colors, it also allows them to use their Kumbaa (creativity). It also develops their fine motor and cutting skills. One of the Kwanzaa principles is Unity. We used plastic champagne glasses (you can find them at a grocery store in the picnic isle) and painted them with red and green fabric paint. Now the children have their own unity glass to use at home. To reinforce the concept of unity, we had the children made a Kwanzaa unity chain. I cut out strips of red, green, and black paper. The children used chalk to color on the paper. Then we made a chain with all the paper. We made sure to write the children’s names on a piece of paper to show that we are united in our friendship. 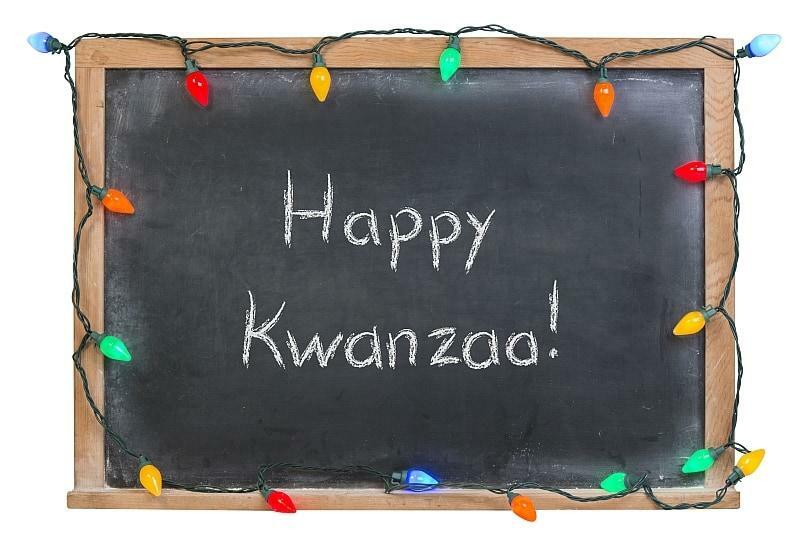 We had a lot of fun and it made for a great Kwanzaa decoration. Kufi(hat)-glue red, green & black strips of paper together so that they all criss-cross in middle (like a star). Use a black strip of paper as the headband (fit to students’ heads). Glue ends of each strip of paper inside headband to make kufi-style hat. Dye 3 groups of Mostaciolli noodles red, green, and black with alcohol and food coloring (you can get black food coloring at craft stores in the cake decorating section). Let dry. Give each child a piece of yarn with a small piece of masking tape wrapped around one end. Let each child string the Kwanzaa colored noodles. Let the children try this version of African cloth dyeing to make placemats for snack time. Have them dribble rubber cement in designs on sheets of white construction paper. Allow the glue to dry for about half an hour. Then have the children brush paint over the glue. When the paint has dried, let the children peel off the rubber cement to reveal the designs they created. Leopard Masks- Paint back sides of paper plates yellow. When the paint has dried use black felt-tip markers or black paint to make spots. Glue on nose and ear shapes and add tissue paper strips. Elephant Masks- Paint the back sides of paper plates gray. Glue on trunks, ears, and tissue paper strips. When the children have finished, display their masks on a wall or bulletin board. Or attach tongue depressors for handles and let the children use them for dramatic play.